I bought some new cool stuff at a local show. I only bought Moroccan material. 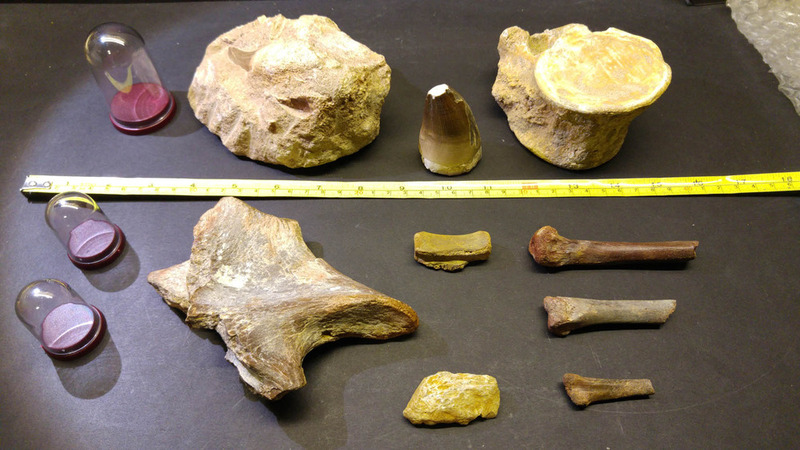 A few Mosasaur pieces and stuff from Kem Kem. I've only started cleaning and will research them a bit more later. So I thought I'd share some pics first. I also got some new display items that will be nice to showcase some of my other stuff in. First there's a chuck with two roots and one tooth. There's also some bone fragments that look like they could be jaw pieces. Will be a fun prepping project. Then there's a Prognathodon tooth that isn't the prettiest but it's really big and it was cheap so I had to get it. And at the end there's a Plesiosaur vertebra with a partial neural arch that will be fun to clean. On the left there's a neural arch from a Spinosaurid. I compared it to the recent reconstruction of Spinosaurus and it looks like it's a pretty close match with some of the first dorsal vertebrae. Middle top there's a small caudal vertebra. Middle bottom there's a fish jaw. And on the right from top to bottom. 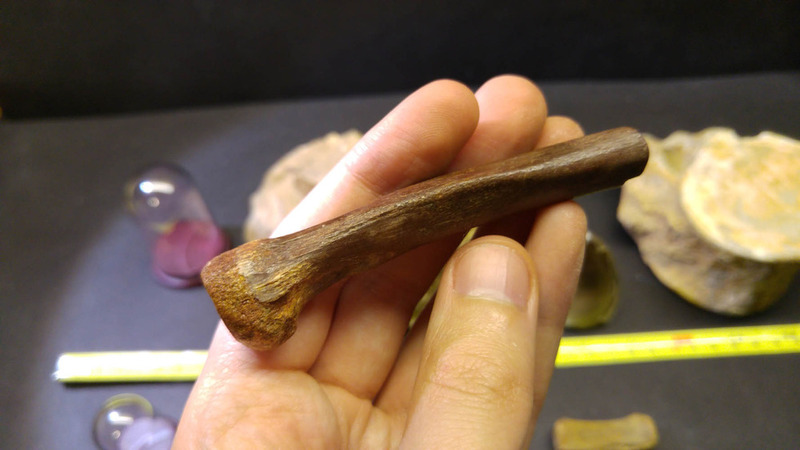 A possible distal femur. A metacarpal/tarsal? And a possible proximal tibia. All three are hollow and probably Theropod or bird. So I have some research and cleaning to do! 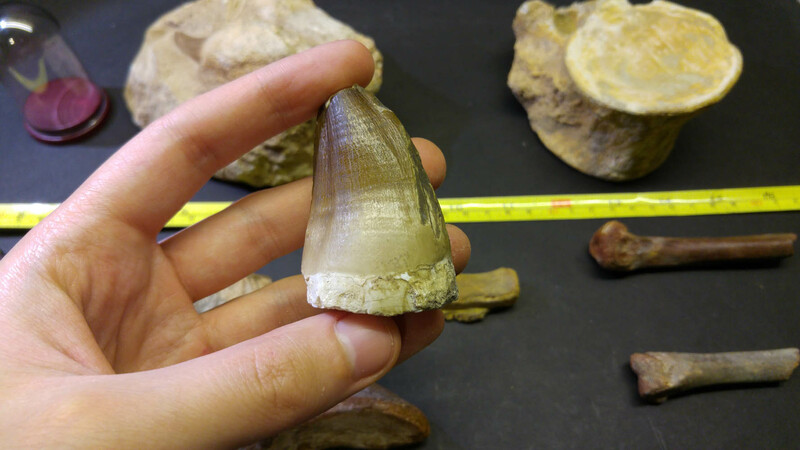 Really big ugly Mosasaur tooth. 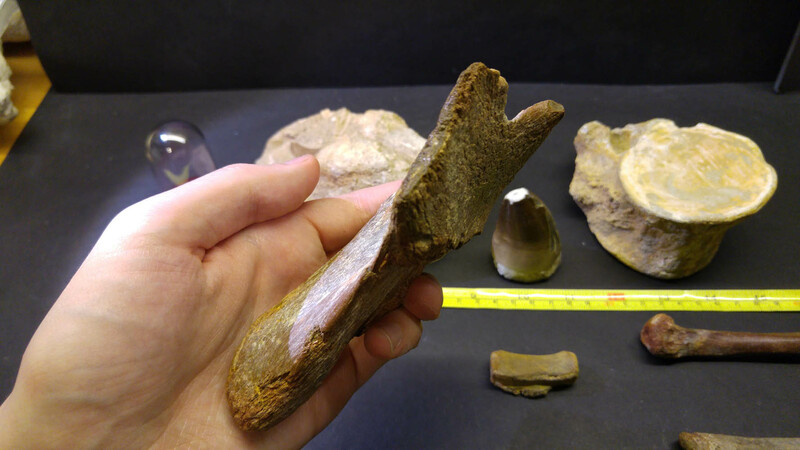 Mosasaur tooth and jaw fragments. Distal femur. It's very asymmetrical as well. Metacarpal or tarsal. The head is almost symmetrical but the shaft seems to be angled more. Spinosaur neural arch from a different angle. Roughly a dorsoposterior view. Since it's not very complete on one side this will make for a great piece to scan and digitally mirror so that I can recreate a bit of the missing pieces. So I'll be having fun with these pieces for a while. Lots of nice goodies, nice pickups. You will have fun trying to put a face to them. I especially like that metacarpal/carpal very rare from that region and a nice one. 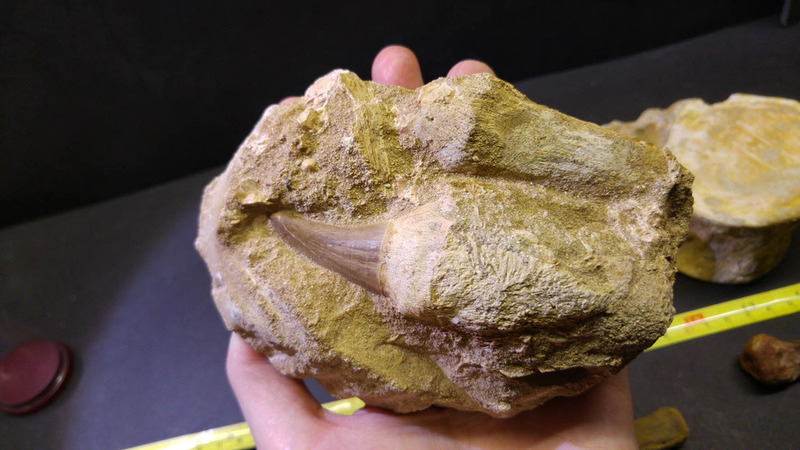 Nice Mosasaur tooth in matrix, the real deal. Have fun. I did some more digging. I'm now fairly certain that small limb piece is a proximal tibia. It shows a lot of similarities with that of Bambiraptor as well as Spinosaurus B. Though the end is damaged a bit so I don't think I will be able to put a genus on this maybe not even a family. Some definite good news on the neural arch fragment. Due to some fantastic reference, I'm now pretty sure that this is a mid-cervical of Sigilmassasaurus brevicollis. 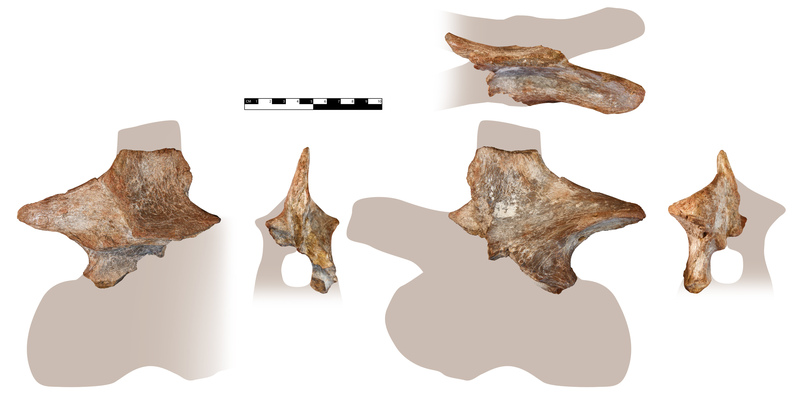 In this paper I have I found a pretty exact match to my fossil. the paper also shows the differences to other Spinosaurid material from Kem Kem. There are very clear differences and the other Spinosaur material comes nowhere as close a match as Sigimassasaurus does to my fossil. That's my first definite Sigilmassasaurus material. So I'm pretty happy with this knowledge. For those interested, here is the title of the paper, it can be found on PeerJ. I'm less sure about the possible femur though. None of the theropods seem to match. I made some new photos and added an outline based on the holotype of Sigilmassasaurus. While not exact match it's still close enoguh that I'm confident in saying that it's from Sigilmassasaurus instead of Spinosaurus aspecially since those cervicals are very different. Looks good on neural arch. I like you're artwork. That paper basically confirmed the Sigilmassasaurus taxon. Its perfect for your specimen. Yeah the tibia is a bit worn. 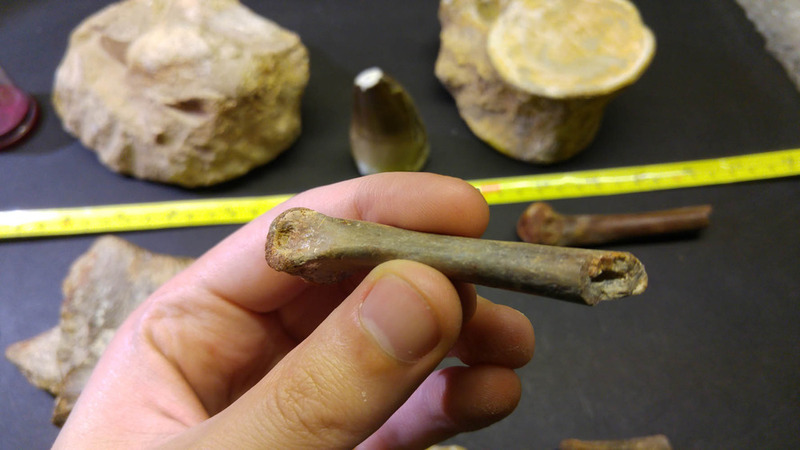 The possible femur and metatarsal/carpal are in better shape though so I'll definitely keep looking for answers. For those interested. Here's a picture of the neck of Sigilmassasaurus(A) and Baryonyx(B). My vertebra would probably sit just front of the middle of the neck. 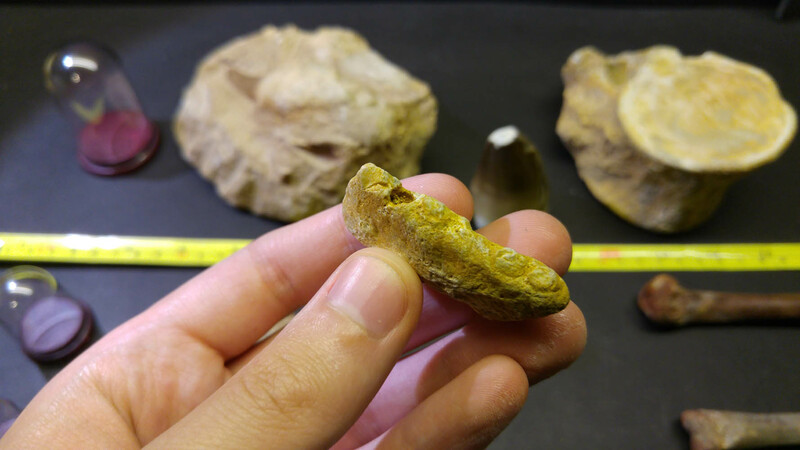 Edit: I just noticed that that possible femur piece has gnaw marks just like the other dinosaur vertebra with gnaw marks I have. There aren't nearly as much gnaw marks as on that other vert. But they definitely are the same kind of marks. Small update. It took a while but I've made a 3d scan of the Sigilmassasaurus neural arch. I've also added mirrored parts so it gives a better indication of what it should look like. What's interesting is that the neural spine is has a slight bend to the left. Much of the front of the prezygapophyses in front are missing as well as the centrum underneath. A small part of the neural spine is also missing. Love you're 3D imagery. Very good job identifying your neural arch.